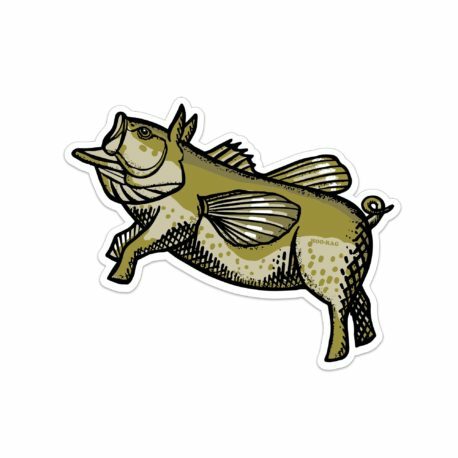 People say “When pigs fly” they mean something will never happen, but Hooligans make it happen everytime they hit the lake to go bass fishing. If jumping fatty bass is in your DNA then this is the hat for you. This trucker features a high-density screenprint design, mesh back, and a rope detail on the bill. Get this hat now and receive a free matching Hoo-rag and sticker! Very cool hat. Great product will order again. Great looking and quality build. Best part was the first day I wore it out for lunch and had 3 people ask about the pig with wings. Made me laugh every time. My new favorite fishing hat. Also love the matching banana. Another great Hoo for my collection. Great hat and feel! Had the boating partner jealous wearing this well made hat!